Last week, I celebrated the progress we've seen in cleaning up wayward pie charts, and today I again use Pi Day as an opportunity to give the world #OneLessPie. Since I am at Discovery Summit Europe in Amsterdam this week, I chose a European topic for my makeover. 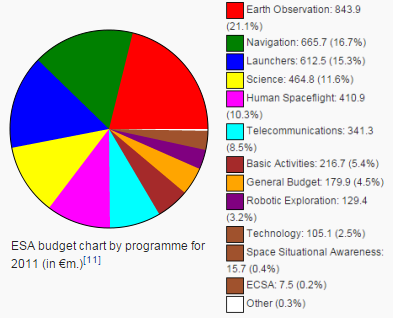 I started with the pie chart below from the Wikipedia page on the European Space Agency (ESA). The chart shows the breakdown of the budget by domain. The good news is that the wedges are ordered by size, but the bad news is that there are too many wedges to make sense of and the colors are saturated. And it seems the three wedges that precede the "Other" category all have the same brown color! At least, the colors are nicer, and the wedges are labeled directly. But the 3D view distorts the sizes, and I can't figure out the order of the wedges. This is actually the 2016 budget; the Wikipedia page had only the 2011 budget, so I had to update some of the text as well. Here is my replacement, a simple bar chart that uses length to more accurately encode the values and doesn't need multiple colors to distinguish the items. Should the axis be in euros or percent? Should the bars be labeled with values? Should I combine the tiny domains into an "other" group (note that they are invisible in the 3D pie chart)? Should I include the asterisk from the original indicating "includes Programmes implemented for other Institutional Partners"? Or should I indicate that information with a different shade of bar? Should I add grid lines? Should I include last year's numbers? In the context of Wikipedia, I opted for simplicity. 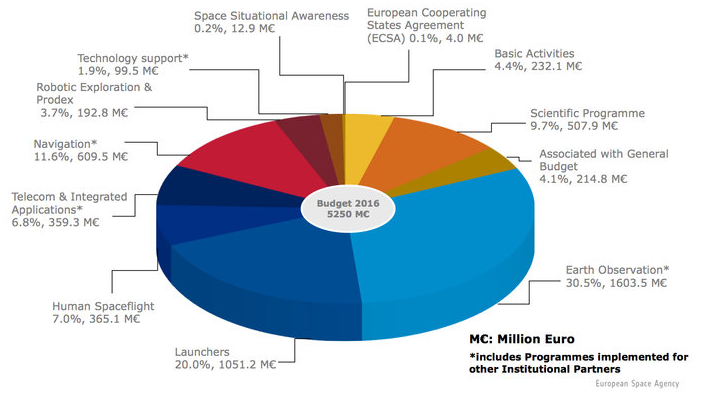 But if this chart were part of an ESA report, for instance, I might choose differently on some of those questions. That is, the intended message affects our design decisions. JMP Tip: How did I get the axis tick marks to say "500M€" instead of "500" or "500,000,000"? I could get the "M" part by using the new-with-JMP-12 "Precision SI" number format, but that doesn't go all the way. Instead, I added a Value Label column property with just these numbers in it, formatted the way I wanted, and the axis picked those up. Happy Pi Day! I look forward to seeing your makeovers. Share them using #OneLessPie. Thanks. Keep working on it and some day we will win. Log scales for some bar charts are interesting...but often confuse people. But somehow the "trivial many" for some subjects need fair treatment.